Casting call for Christmas cookie baking show. 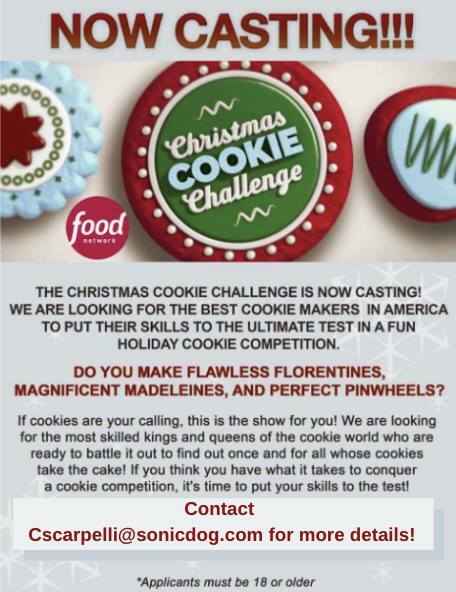 The Christmas Cookie Challenge is holding a casting call for the best cookie makers in the country. If everyone loves your amazing cookies, here is a chance to put your baking, cookie making skills to the ultimate challenge. Come tryout for the holiday cookie making competition. Can you whip up some amazing Florentines? Can you bake the ultimate pinwheels? Maybe you rock your magnifiscent Madelines? If cookies are your calling, this may just be the show for you. Casting directors are looking for serious cookie making skills, the kings and queens of the cookie baking world, who are ready to battle it out on TV and find out whose cookies take the cake. If so, read on for a chance to enter the Christmas Cookie Challenge reality show and possibly win. If its time to put those skills to the test, see the casting notice below for all the details.